So I decided yesterday that I would do Inktober again this year. 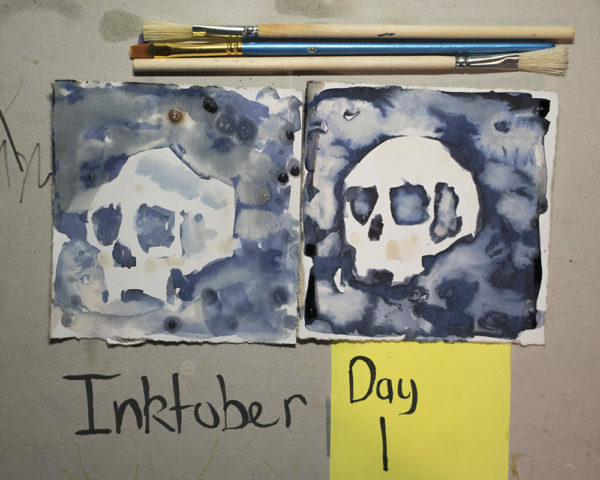 Inktober is a challenge created by Jake Parker to try and improve drawing skills with a focus on doing an ink drawing every day in October. Last year I did a still life every day based with an improvised tool, including some dip pens I made out of clay that had varying success. I really enjoyed making and finding different tools and even made a few brushes out of various material including my own beard. This year I am playing with ink and bleach. The beach is mixed with water and added to the ink drawing to create different effects. It is something I did in art school which was really fun and random. The ink in question is black Quink by Parker as it easily bleaches the colour out, the only thing is it is much more blue than I remember. The card is like cereal packet card but without anything printed on it so glossy on one side and grey on the other. Probably limit myself to something like skulls for ease of a theme. This entry was posted in drawing, Learning and tagged art school, bleach, cereal packet, domestos, drawing, experimental, ink, inktober, Jake Parker, Joseph Travis, quink. Bookmark the permalink.